Star hero Akkineni Nagarjuna and legendary filmmaker Raghavendra Rao are known for delivering devotional hits like Annamayya, Sri Ramdasu and Shirdi Sai. The hit combination is set to weave magic again with yet another devotional outing Om Namo Venkateshaya. The film traces the life history of saint follower Hathiram Baba, an ardent devotee of Lord Venkateswara Swamy. Nagarjuna is doing this film after Soggade Chinni Nayana. The film that released for last year’s Sankranthi impressed the fans. Now, this is the time to take the fans and audiences on a devotional ride. Hathiram Baba (Raama) was a devotee of Lord Rama. He will be so excited and determined to meet the God. Raama’s parents will set a marriage with his in-laws daughter. Raama cancels the marriage and visits Tirumala to see Lord Venkateswara Swamy. There he meets Anushka who will be supporting to eliminate the bad things which will happen at Tirupathi. With the help of Anushka, Nagarjuna will be making more devotees for Lord Venkateswara. When he visited Tirumala, he decided to stay there and set up an ashram outside the temple. 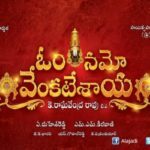 Overall Om Namo Venkatesaya is a good one time watch for devotional movie lovers. Well, he succeeded yet another time with a devotional film. Without any non-sense comedy and best combination for a devotional movie got the best result. This movie will remain best in Nagarjuna’s Career. He explains significance of Swami vari sesha vasthram, Agni teerdham and Nitya Kalyanam etc rituals easily understandable for current generation. Nagarjuna: He delivers his outstanding performance in the role of Hathiram Baba. Anushka: She plays the role of Krishnamma but nothing remarkable in the first half. Pragya Jaiswal: She appears in a surprise special role. Jagapathi Babu, and Saurabh Raj Jain in a supporting role. Which begins with a devotee and ends with his devotional approach towards Lord Balaji at Tirumala in 1500 B.C. Om Namo Venkatesaya is emotionally not on par with Annamayya, but a must watch for devotees and a decent watch for all. Production values are good. The music has been composed by M. M. Keeravani. The movie has good songs and the background music mesmerises you and take you to the feel. After leaving the theatre you will think about Nagarjuna for his outstanding performance in the role of Hathiram Baba.